Oscar®-winning actor Jean Dujardin, winner for Performance by an Actor in a Leading Role for his role in "The Artist." ©AMPAS. (Click on photo for hi-res version). HOLLYWOOD—Two films paying homage to the Golden Age of Cinema divvied up many of feature film Oscars Sunday, with the black and white silent film “The Artist,” winning five awards including Best Picture, Best Director and Best Actor, and Martin Scorsese’s “Hugo,” about French film pioneer George Melies, racking up five technical awards. Moments after taking their bows onstage, the winners spoke with reporters backstage for a chance to further discuss their wins. Meryl Streep was obviously moved about receiving her third Oscar statuette Sunday, delivering a heartfelt thank you onstage to her husband of 33 years, sculptor Don Gummer, and her longtime hairstylist. Backstage she revealed that the win for her depiction of former British Prime Minister Margaret Thatcher in “The Iron Lady”—three decades after her last walk to the Oscar podium—truly caught her by surprise. Octavia Spencer, Oscar®-winner for Performance by an Actress in a Supporting Role, and Meryl Streep, Oscar®-winner for Performance by an Actress in a Leading Role, attend the Governor's Ball. ©AMPAS. (Click on photo for hi-res version). After winning the Oscar for Best Actor Sunday, the burning question backstage was would he now become a Hollywood movie star. A reporter then asked him whether he had accidentally dropped the f-bomb in French during his acceptance speech, and he coyly admitted he did. “Ah yes, I did. I’m sorry,” he said, with a smile. 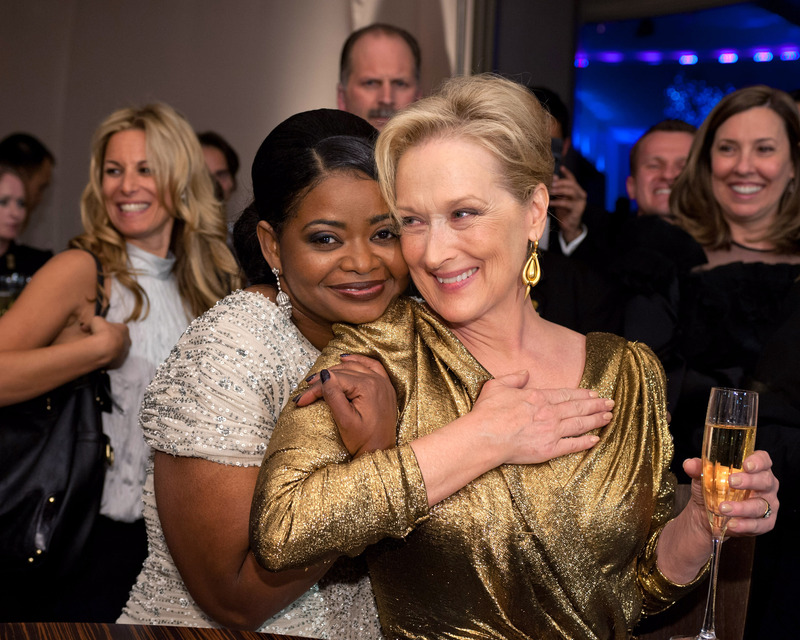 Still emotional from her Actress in a Supporting Role win for her depiction as a maid who finds the courage to speak out in the segregated south in “The Help,” Octavia Spencer told journalists she is looking forward to doing more than acting in the future. At 82, Christopher Plummer became the oldest actor ever to earn an Academy Award Sunday night for his supporting role in “Beginners,” in which he played a longtime closeted gay man who comes out in his ‘70s. But the Canadian native revealed backstage he isn’t about to ride off into the sunset now with his first Oscar win. 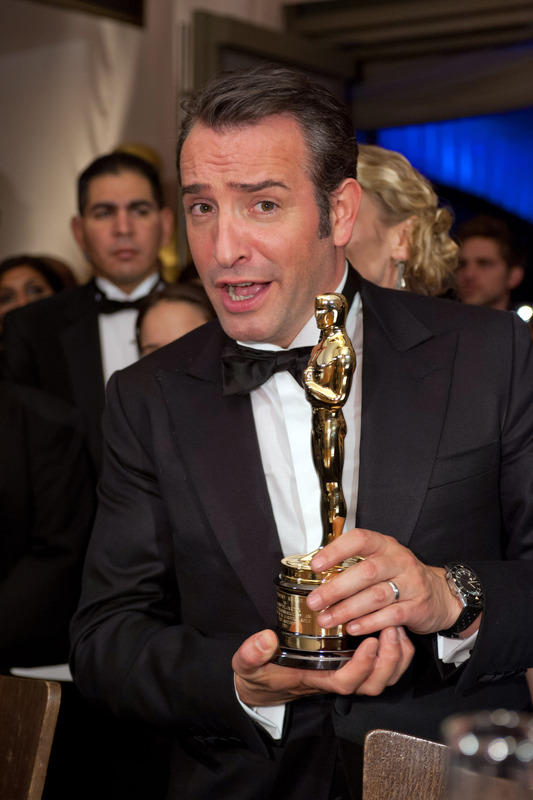 For the category Best Motion Picture of the Year, the Oscar® goes to "The Artist" produced by Thomas Langmann. Thomas Langmann poses backstage with Oscar®-winning director Michel Hazanavicius, winner for Achievement in Directing for work done on "The Artist" ©AMPAS. Thomas Langmann said the key to getting the black and white silent film made was being tenacious and the struggle was worth it. 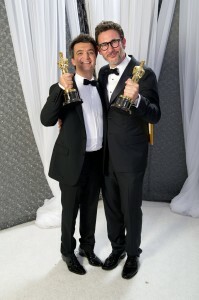 “Hugo’s” art director Dante Ferretti had more than one reason to celebrate his big win Sunday night. “Today is my birthday,” he said with a big grin, while clutching his Oscar. His colleague, Francesca Lo Schiavo, who won an Oscar for set decoration, explained her passion for her work after winning her statuette. For J. Roy Helland, who won an Oscar for styling Streep’s hair in “The Iron Lady,” it was a joy to win the same night she did, after working with the actress for 37 years. “A Separation” became the first film from Iran to win an Academy Award, and no one was happier Sunday than the film’s writer-director Asghar Farhadi. Backstage, he addressed the subject of the film’s significance in a global context. “It came from the heart,” he explained. Though the film is about an underdog inner-city Memphis high school football team and its inspiring white coach, its producers said the impetus to make the film was socioeconomic not race. “Rango” director Gore Verbinski explained what it was like receiving an Oscar for his animated feature “Rango,” featuring the voice of Johnny Depp as a lizard. Bret McKenzie, who wrote the music for “The Muppet Movie,” was pleased to take home the Oscar for his “Man or a Muppet,” revealing he was inspired by hours of viewing Jim Henson’s Muppets when he was a child. Alexander Payne, who is of Greek descent, translated a bit of his onstage speech that recognized his mother in picking of an Oscar for Best Adapted Screenplay for “The Descendants.” He also spoke of getting acclimated to Hawaii, where he shot his film, starring George Clooney. Standing alongside his co-writers Jim Rash and Nat Faxon, he revealed what he said to his mother, shooting in Hawaii and using local music. He also revealed that for his next project he is remaking another Hollywood movie, “The Search,” a black and white melodrama, which originally starred Montgomery Clift. No word yet on who will play Clift’s role, though his wife and “Artist” leading lady Berenice Bejo will be in the cast.